A frequent reason why a cat is brought to see me is blood-tinged urine. Often bloody urine is accompanied by my patient urinating outside the litter box. This usually makes the problem easier for pet parents to identify. There are three common reasons for bloody urine, also known as hematuria. These include urinary tract infections, crystals in the urine, and interstitial cystitis. In older cats with decreased kidney function, blood-tinged urine can be a sign of a bacterial urinary tract infection. Young cats with healthy kidneys almost never have urinary tract infections because their urine is so concentrated that bacterial growth can’t occur. In older cats with more dilute urine, urinary tract infection can be limited to the bladder, or, in more serious cases may involve one or both kidneys. 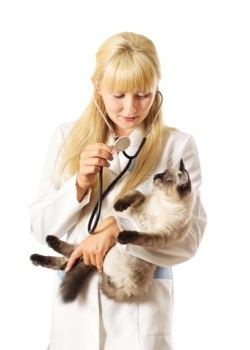 When a kidney infection is present, a cat will often demonstrate weight loss and a poor appetite. Visible blood in the urine is a sign that infection may have been present for a longer time, as an early, mild infection demonstrates the presence of red blood cells only when urine is looked at microscopically. Other signs of urinary tract infection include increased thirst, increased frequency of urination and straining to urinate. In advanced cases of kidney infection, the owner/guardian may tell me, “My cat hangs his head over the water dish, but won’t drink very much.” Fortunately, bacterial urinary tract infections can usually be cleared with appropriate antibiotic therapy. In cases of kidney infection, antibiotics will need to be administered for at least four to six weeks. In younger cats a common cause of bloody urine is the presence of crystals in urine (crystalluria). When left undiagnosed and untreated, these crystals can lead to blockage of the urethra in some male cats. Because they can’t urinate through a blocked urethra, this creates a medical emergency, rapidly leading to kidney failure, and even death within 48 to 72 hours. In female cats and some male cats, mineral crystals in the urine (normally, either calcium oxalate or struvite) can lead to the formation of stones, but not urethral blockage. These stones can be found in the kidneys, ureters (the connecting tubes between the kidneys and the bladder) or in the bladder. Not only do stones cause blood in urine, they can also cause chronic or recurrent urinary tract infection. If a stone blocks a ureter, loss of the kidney “upstream” can result. Fortunately, ureteral stones are relatively rare. Crystalluria and stones are managed by special diets and in the case of calcium oxalate stones, surgery to remove the stones, as they cannot be dissolved by struvite dissolving diets. The third and most common reason for bloody urine is interstitial cystitis. We are just starting to understand this complex and often frustrating disease, which appears to be the most common cause of recurrent blood in a cat’s urine. In addition to blood tinged urine, increased frequency of urination and straining to urinate may also be seen. This disease is diagnosed by excluding crystalluria, urinary tract stones, and urinary tract infection via analysis of urine, urine culture and abdominal radiographs (x-rays) or ultrasound. It is managed by diet modification, increasing canned food to increase the cat’s hydration and thereby decrease the concentration of his urine. When clinical signs arise, pain medication is important. More recently, it has been demonstrated that environmental enrichment (more toys, cat perches, less stress) can help reduce the frequency of episodes of painful and bloody urination caused by interstitial cystitis.